Almost 2,000 sq.ft. of luxury living, our spacious condo is located in one of the finest complexes in Zihuatanejo (Zihua for short). La Casa Que Ve al Mar was designed by locally famous Mexico architect Enrique Zozaya (La Casa Que Canta Hotel). Our beautiful 39-unit complex is located above Playa La Ropa, one of Mexico’s best swimming beaches. Our condo (a desirable end-unit in the front-building, one of the largest in the complex) is directly above the double-arches to the left (above pool) in the photo. From our extra-large 600 sq.ft. tile-covered veranda overlooking the TWO Infinity Swimming Pools, you will enjoy a quiet, luxurious vantage point, where you have uninterrupted panoramic views of Playa LaRopa, Playa Las Gatas, and Zihua Bay --- fishing boats, cruise ships, and spectacular sunsets. Two large bedrooms and two bathrooms, it comfortably sleeps four guests. If there are only TWO guests, it can be rented as a "one-bedroom/one-bath unit". The Master Bedroom features a King-Sized Bed and French Doors that open to the Veranda and the gentle ocean breezes. The Master Bathroom has a large walk-in shower (with a view of the Bay) and beautiful Mexican Tile-work. The Guest Bedroom has Two Twin-Beds and a bathroom with walk-in shower. Enjoy cooking in our fully equipped kitchen (juicer, blender, toaster, microwave/convection oven; and much more); there is a washer/dryer in the unit; maid-service three times a week; three mini-split air-conditioners and five ceiling fans; satellite TV; wireless internet access; filtered water throughout the unit with specially filtered water for drinking in the kitchen; covered assigned parking; 24-hour security; Bi-lingual on-site management and Guest Services; beautiful landscaping. No Smoking and No Pets. Please respect our neighbors and keep noise to a minimum after 10PM. 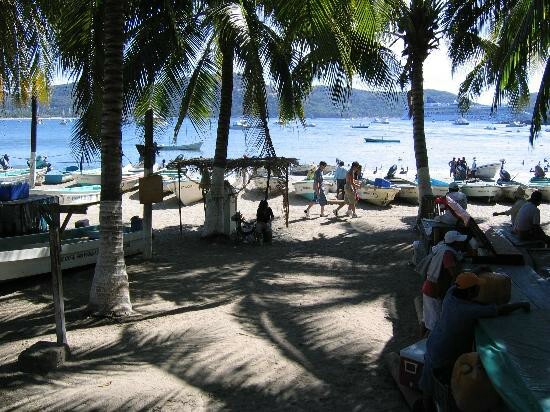 Zihuatanejo is a charming old-world Mexican fishing-village (made famous in the movie "Shawshank Redemption"). With temperatures YEAR-ROUND averaging 80-90-degrees F during the day and 70-degrees F at night, the area is often referred to as the "Mexican Riviera". There are several wonderful beaches --- Playa Principal is located in Centro (downtown Zihua); Playa Madera is a small local beach; Playa La Ropa is one mile of beautiful white sand; Playa Las Gatas is accessible by boat (or a walk along beach-rock-path) and was rumored to be the private swimming beach of ancient royalty; MANY other wonderful beaches are located just a short drive from Playa La Ropa (by car, taxi or local bus). Centro, the "downtown" area of Zihua, is filled with shops and restaurants. You can watch the fishermen bring in their catch (and purchase the freshest seafood anywhere! ); stroll the streets (many are pedestrian-only); shop at the colorful Bazaars, Boutiques and Art Galleries; and participate in the Sunday Family-Day Festivities in the Town-Square. If you get tired of relaxing (?!) there are many varied activities to keep you busy. Golf (two courses are within 10-15 minutes, one of them designed by Robert Trent Jones), Fishing, Snorkeling, Surfing, Sea-Kayaks, Horse-back Riding, Biking, Para-sailing, Zip-Lines, and Sight-seeing are all available. Or, perhaps you’d enjoy a day of pampering at one of the many first-class Spas in the area. Our on-site Guest Services can make arrangements for any of these! For those who want to visit the modern resort area of Ixtapa, it is just 15 minutes north of Zihua. Beautiful beaches, golf courses, tennis, major hotels and restaurants. Combining the OLD and the NEW, Zihua and Ixtapa offer "twice the fun"! Enjoy two destinations for the price of one. For more information, maps, weather, etc. please click on our "Interesting Links".